Protons are positively charged parts of atoms. A machine called a synchrotron or cyclotron speeds up the protons, which are then directed precisely at the tumour. 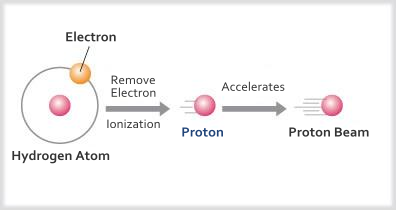 After protons reach the desired place in the body, they deposit the specified radiation dose in the tumour. With proton therapy, there is minimal radiation dose beyond the target area. Thus, it is able to deliver precise radiation dose to the tumour site while minimizing the damage to surrounding normal tissues and critical structures as compared to conventional radiation therapy.